Many people find themselves searching for a Fairbanks lodge to watch the Northern Lights, and they just don’t know where to begin. One thing to consider is choosing a location outside of the city so that the light pollution from downtown can’t impact your viewing. The less light, the better your views (and photos!) will be. 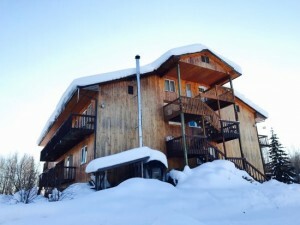 Alaska Grizzly is a beautiful European style lodge located 7 scenic miles from downtown Fairbanks, surrounded by spruce forest and hiking trails. You can take a short trek to visit the famous Alaska pipeline, and you might even see a moose along the way! This lodge sets itself apart from the competition with its cozy common areas, comfortable rooms, delicious food and easy access Aurora viewing. Rooms feature private bathrooms, cable TV, wireless internet and patio decks. There are full kitchen and laundry facilities available to guests. But what really makes it special is the top of the line service provided by Anita, the innkeeper and owner. She cooks incredible breakfasts each morning, makes sure that guests are happy and keeps the common areas clean, comfortable and decorated with true Alaskan charm. Her family owns a music shop so there are even guitars available for guests to play! You never know when the Aurora is going to appear, so having an easily accessible viewing spot is a must when staying in the Fairbanks area. With Alaska Grizzly’s patios located right next to each room, you never have to take a cold walk outside to see the Aurora in action. Just throw on your jacket and step out onto the deck. That way you can at least determine whether it is worth getting completely dressed and getting your camera set up. Its so easy, you couldn’t ask for a better viewing situation! 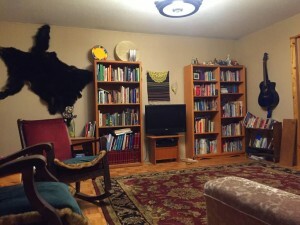 Anita’s personal touches make this place one of our top choices for Fairbanks bed and breakfasts. Relax and read a book in a cozy armchair in front of a warm fireplace with bearskin rug hanging behind you. Fill up in the mornings with Anita’s famous Grand Slam Grizzly Breakfast. You can always enjoy the classics like fresh eggs, toast, bacon, home fries, cereal, coffee and orange juice. And if you are lucky Anita might make one of her specialties, like Swedish apple pancakes. Our top priorities at Gondwana Ecotours are the safety, comfort and happiness of our clients. Working with Anita and Alaska Grizzly Lodge guarantees that guests on our trip will be comfortable, rested, well taken care of and of course well fed. 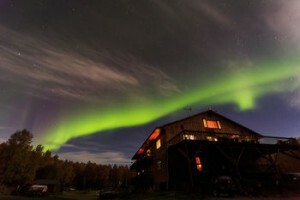 Staying at Alaska Grizzly Lodge is a unique experience offering all the best of the area: beautiful nature, a rustic but comfortable atmosphere and prime Aurora viewing. On our Northern Lights Alaskan Adventure you will get to try dogsledding, hiking with reindeer, soaking in hot springs and more. Learn how to curl from local players and visit a family organic farm to learn what homesteading in Alaska is like. Both of these are exclusive activities we designed ourselves. 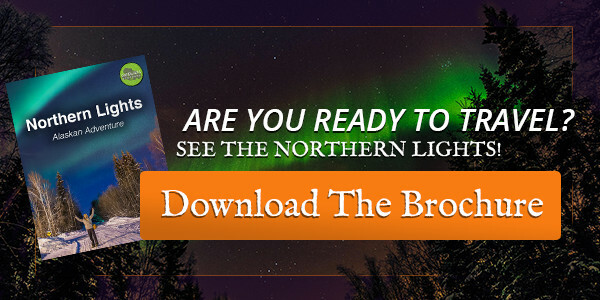 This adventure is the best way to get the full Alaskan experience: exciting and unique day activities with premier Northern Lights viewing at night. We even have a night guide who provides personal wake up calls when the lights are active! The best Alaskan activities, freshly prepared hearty Alaskan meals, and amazing aurora views at night. This is truly the ultimate Aurora adventure!